Climate protection has been important to syracom for quite some time now. Our employees participate actively in projects like the installation and care of a meadow orchard which syracom owns in Wiesbaden as well as the colonization of bees on this meadow. It is important to us as a business to act environmentally friendly and with social responsibility. At the end of 2017, syracom decided to go one step further, to determine its own CO₂ foot print, and to compensate for it as climate partner of Naturfund by participating in a climate protection project – planting trees in Madagascar. 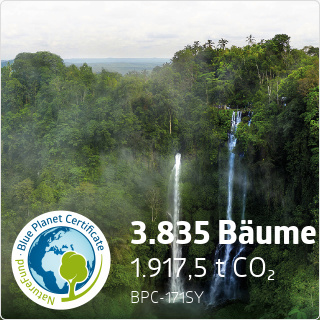 In return, we receive the Blue Planet Certificate as CO₂-neutral business. Our climate balance was studied during an in-house project. It shows which places in the company generate how much CO₂ annually. In this manner we determined the number of trees we would have to plant to compensate for our CO2 output. For 2017, we first identified and recorded all CO₂ emission sources in the company. These CO₂ emission sources were collected in the areas 'work place', 'mobility', 'events', and 'other consumption'. They are represented in the CO₂ emission tree on the left. We also defined sources in which it is possible to cut down. We studied all CO₂ sources and determined which need to be considered in the balance. Areas for which we did not have CO₂ values or for which determination is prohibitively difficult were not considered. The reduced emission tree on the right contains an additional branch which determines the type of compensation. There were also areas in which it was possible to cut down. Based on the adjusted tree diagram we determined all data for calculating our CO₂ emissions. Using a CO₂ calculator provided by the Federal Ministry for Environment and the non-profit organization Naturfund e.V., we calculate our CO₂ emissions. The CO₂ emission values are then added and converted into the number of trees to be planted. A flat 20% is added to the calculated total to compensate for any error margin. The non-profit nature preservation organization Naturefund fights for the protection of ecosystems by awarding the Blue Planet Certificate. Since healthy forests and soil store large quantities of CO₂, Naturefund, with the help of its partners, protects forests, plants trees, and preserves other forms of ecosystems. We are happy to be able to contribute our part to the protection of the last rain forest of Madagascar as well as its unique biodiversity.